National Mother’s Day is a perfect occasion to show your mom how much you care about her, so why don’t you take her to the SQUARE restaurant at Novotel Bangkok Fenix Silom; and treat her with a delicious international dinner buffet specially prepared for your beloved lady. On Wednesday 12th August 2015, the SQUARE presents Mother’s Day international dinner buffet featuring a selection of fresh seafood on ice. Come and enjoy Red Shrimps, New Zealand Mussels and Blue Crabs served with Thai spicy seafood sauce. Mom can also enjoy Sashimi, Sushi and a Healthy Salad Bar as well as a variety of mouth-watering desserts. To make your Mother’s Day celebration more memorable, we also prepare a complementary hand garland for every mom that dines with us on Mother’s Day 2015. 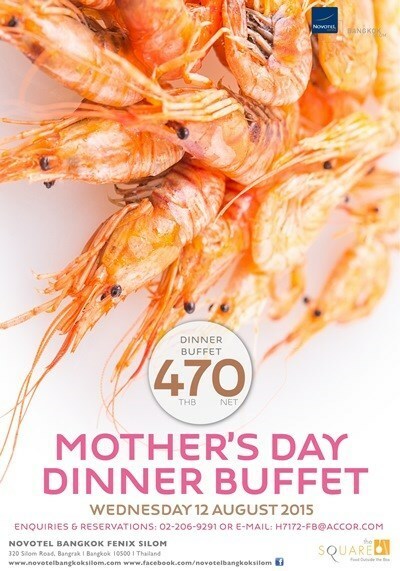 The SQUARE restaurant offers a Mother’s Day dinner buffet for THB 470 nett per person, with a special Come 3 Pay 2 offers. Accor Plus members are welcome! Dinner time: 6.00 p.m. to 10.30 p.m.